Camille Pissarro (1830–1903), Dieppe Harbour (1902), oil on canvas, 46.7 × 55.2 cm, Fine Arts Museums of San Francisco, San Francisco, CA. Wikimedia Commons. Sometimes the least likely places become popular with painters. Dieppe is a modest seaside resort on the Normandy coast of the Channel, but a far cry from the alluring climate and night-life of France’s Mediterranean coast. Yet in the nineteenth century, Dieppe became so popular with landscape painters that it was almost a mandatory visit. Claude-Joseph Vernet (1714–1789), Dieppe Harbour (1765), further details not known. Image by Philippe Alès, via Wikimedia Commons. 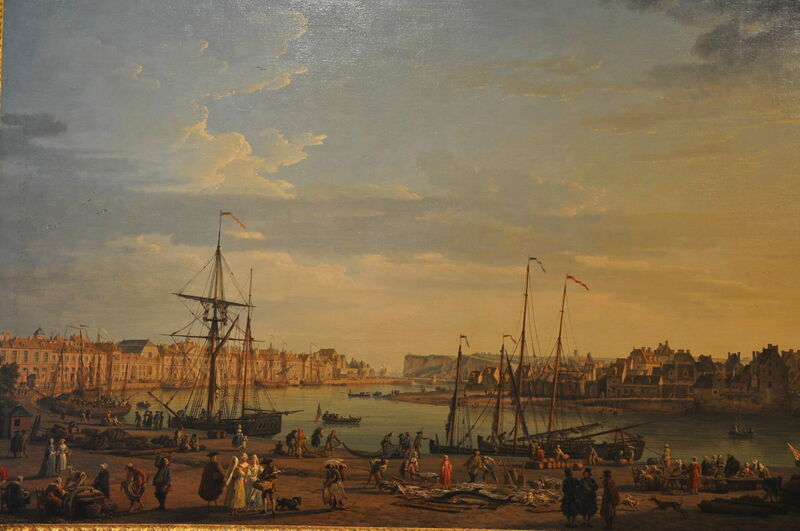 When Claude-Joseph Vernet painted Dieppe Harbour in 1765, it was much like any of the Channel ports. Its harbour developed along the banks at the mouth of the River Arques, and to the north-east are the rolling chalk cliffs which echo those to be found along the northern Channel coast. At this time, Dieppe was a very long way from Paris, as there was no railway of course, and there was no scheduled boat service to England either. John Sell Cotman (1782–1842), East End of Saint Jacques at Dieppe, Normandy (c 1819), graphite and brown wash on medium slightly textured beige wove paper, 29.2 x 22.5 cm, The Yale Center for British Art, New Haven, CT. Wikimedia Commons. 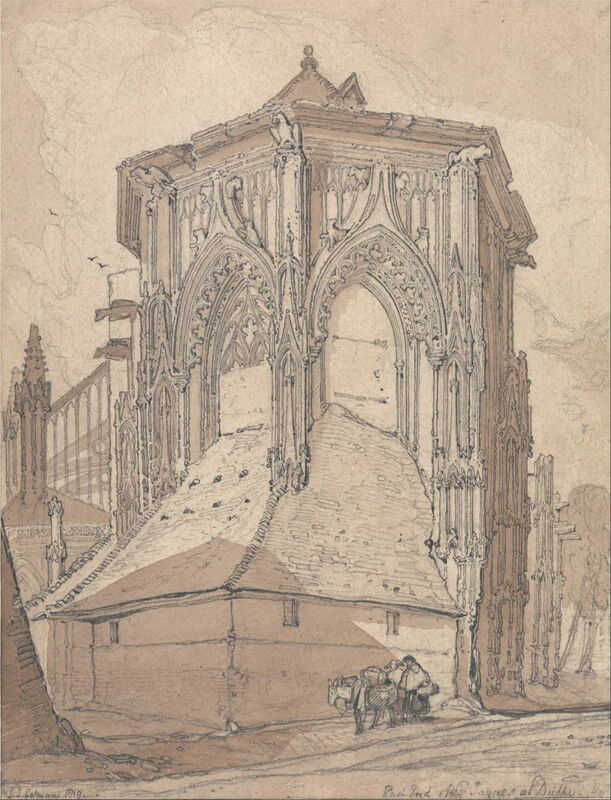 Forgive me for including some works showing Dieppe’s Church of Saint-Jacques, which are not strictly coastal, but this fine graphite drawing by John Sell Cotman of East End of Saint Jacques at Dieppe, Normandy from about 1819 is just so wonderful. It is also an opportunity to point out that Cotman, in company with his friend Dawson Turner, visited this section of the Normandy coast three times between 1817 and 1820. A couple of years later, he published a set of a hundred etchings based on these drawings. JMW Turner (1775–1851), The Harbour of Dieppe (c 1826), oil on canvas, 173.7 x 225.4 cm, The Frick Collection, New York, NY. Wikimedia Commons. 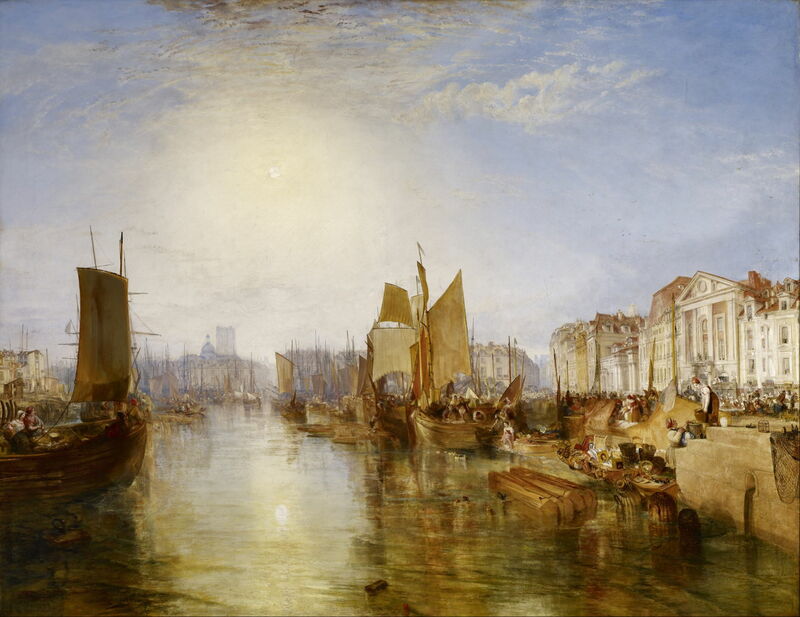 JMW Turner visited France, including the Channel coast, repeatedly, both on passage to Italy and other countries, and as a destination itself. It is likely that he completed the sketches and studies for his painting of The Harbour of Dieppe (c 1826) when he was exploring the Seine during the 1820s. Looking into the sun, along the River Arques, it has something of the ambitious grandeur of one of Claude Lorrain’s classical harbour views. Louis-Gabriel-Eugène Isabey (1803-1886), The Town and Harbour of Dieppe (1842), oil on canvas, dimensions not known, Musée des beaux-arts de Nancy, Nancy, France. Image by Ji-Elle, via Wikimedia Commons. Eugène Isabey caught The Town and Harbour of Dieppe on a greyer day in 1842, with the laundresses in the foreground seizing a break between showers to get on with their work. Then, in the middle of the nineteenth century, Dieppe changed. The Duchesse de Berry (daughter-in-law of Charles X) had visited in 1824, and started the transformation into a beach resort. A couple of years later, its theatre re-opened. Then in 1848, it was connected directly to Paris by a railway line, and Parisians started to flock to its pebble beach. That same year it may have been the port of exit of the last King of France, Louis Philippe I, and his Queen as they fled to Newhaven, England, into exile. In 1853, a regular ferry service was instituted with that same English port, and started to bring foreign tourists to vie for their plot on the pebbles. 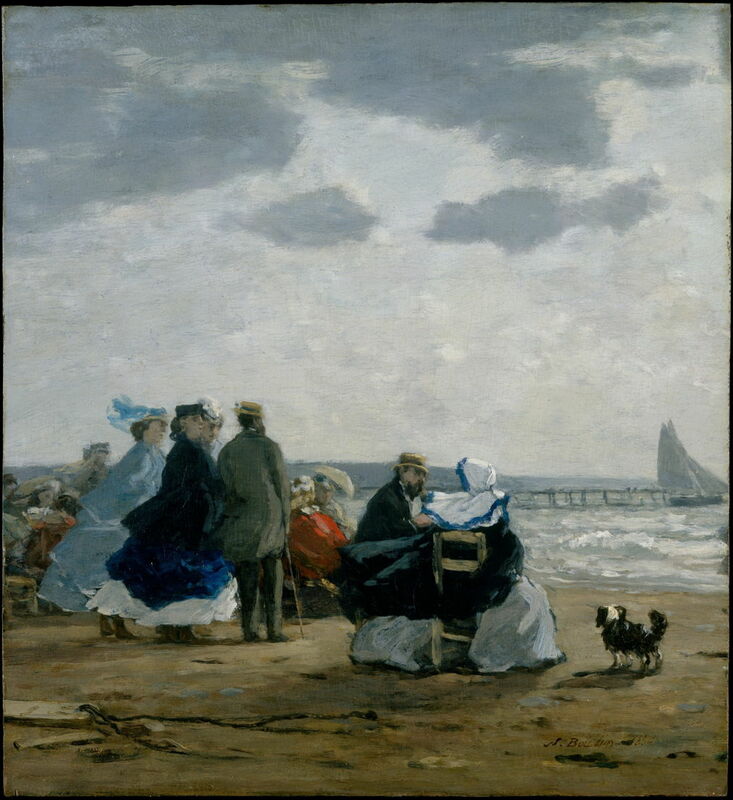 Eugène Boudin (1824–1898), On the Beach, Dieppe (1864), oil on panel, 31.8 × 29.2 cm, Metropolitan Museum of Art, New York, NY. Wikimedia Commons. With the trains and the tourists came painters too, including the pre-Impressionist Eugène Boudin, who painted On the Beach, Dieppe in 1864. Boudin grew up in nearby Le Havre, but by this time was based in Paris. His painterly and atmospheric beach sketches were becoming quite successful, and he had already helped the young Claude Monet to get his own career started. Jules Noel (1815-1881), Panorama of the Town of Dieppe (c 1865), further details not known. Image by Philippe Alès, via Wikimedia Commons. 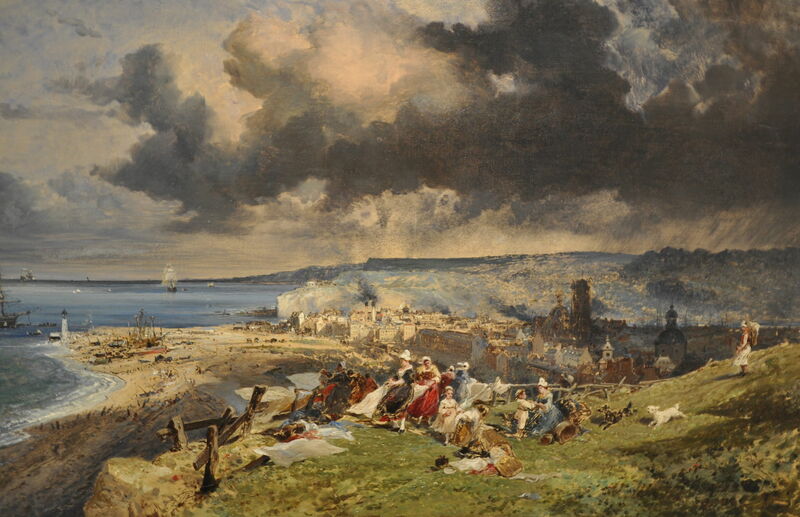 Jules Noel may have followed Isabey’s lead, in his Panorama of the Town of Dieppe from about 1865. Gone are the laundresses, though, replaced by a large picnic party, and he looks in the opposite direction, to the north-east, over the town, its beaches and buildings, to the chalk cliffs in the distance. 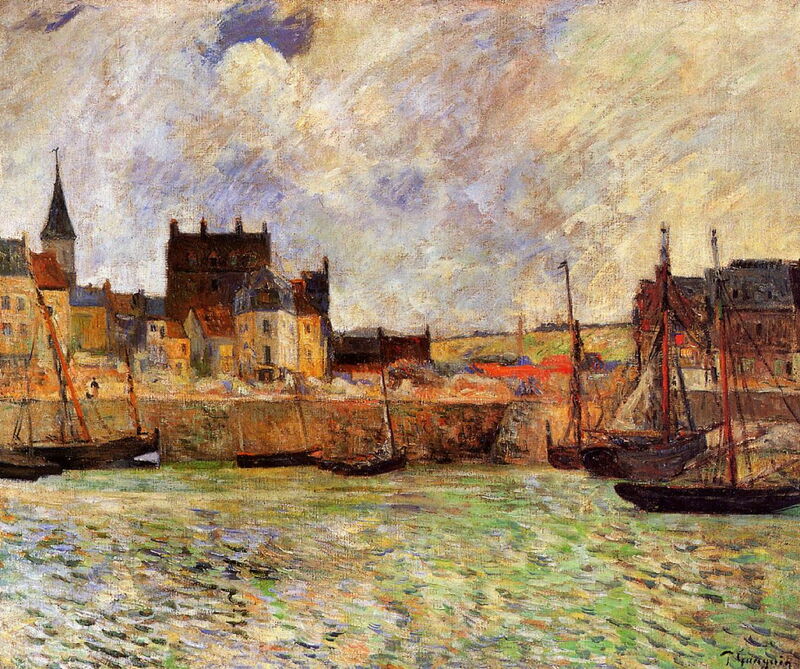 Paul Gauguin (1848–1903, Dieppe Harbour (1885), oil on canvas, 60.2 × 72.3 cm, Manchester Art Gallery, Manchester, England. Wikimedia Commons. Paul Gauguin seems to have visited the town in 1885, perhaps with his young son Clovis, when he was trying to establish his career as a full-time artist. His first year or so were reportedly a real struggle, although his painting of Dieppe Harbour (1885) looks promisingly innovative. 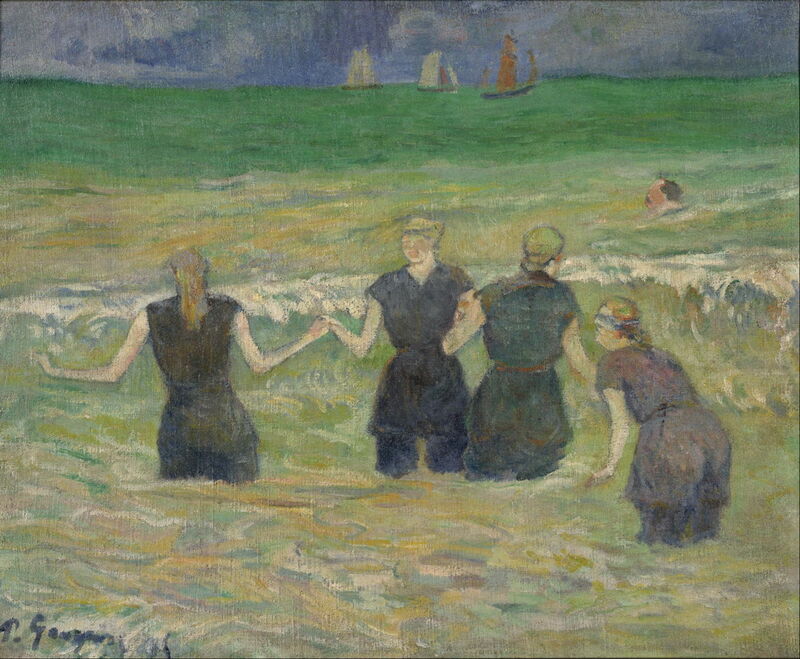 Paul Gauguin (1848–1903), Women Bathing at Dieppe (1885), oil on canvas, 38.1 x 46.2 cm, National Museum of Western Art 国立西洋美術館 (Kokuritsu seiyō bijutsukan), Tokyo, Japan. Wikimedia Commons. In Gauguin’s art, Dieppe is perhaps best-known for him establishing the theme of women bathing, in his Women Bathing at Dieppe (1885). And yes, in the right light the Channel does really look as green as that. Paul César Helleu (1859–1927), On the Beach, Dieppe, Impression, Gray Sea (1885), media and dimensions not known, Musée des Beaux-Arts de Rouen, Rouen, France. Wikimedia Commons. 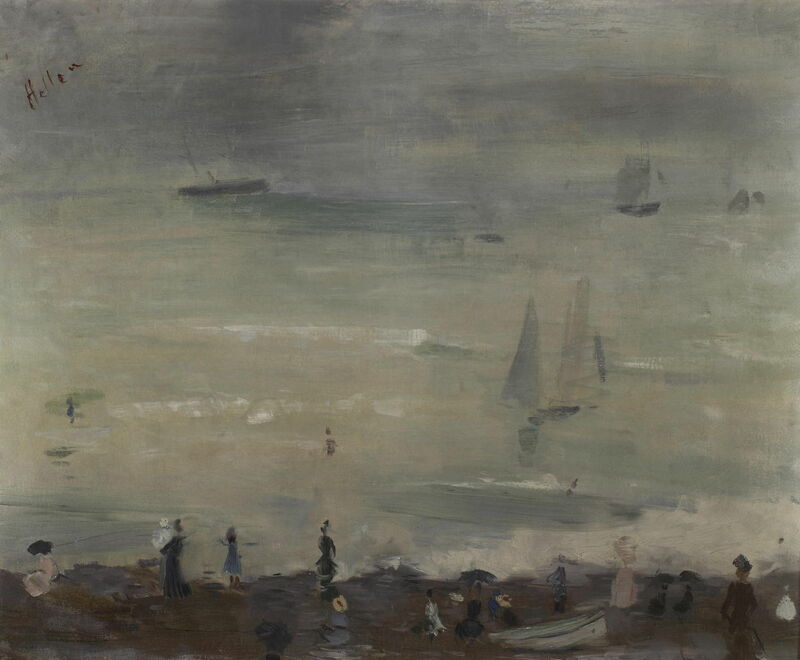 That same year, Paul Helleu painted this unusual On the Beach, Dieppe, Impression, Gray Sea (1885), which may have been when he was in transit to or from London, in the company of the artist who created the next painting. 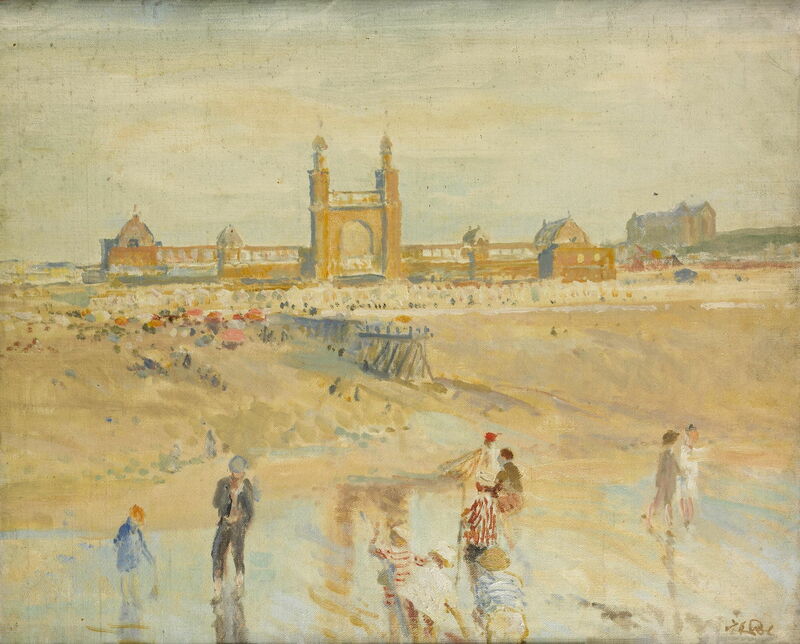 Jacques-Émile Blanche (1861–1942), Dieppe Beach in front of the Casino (c 1886), media and dimensions not known, Musée des Beaux-Arts de Rouen, Rouen, France. Wikimedia Commons. Jacques-Émile Blanche accompanied Paul Helleu when he visited England in 1885, and he too may have taken the opportunity for a short stay in Dieppe, to paint Dieppe Beach in front of the Casino (c 1886). Blanche is not known for his landscapes, but painted many portraits of the famous, including Marcel Proust, Aubrey Beardsley, James Joyce, Edgar Degas, Claude Debussy, Auguste Rodin, Thomas Hardy, and John Singer Sargent. Claude Monet (1840–1926), Val-Saint-Nicolas, near Dieppe (Morning) (1897), oil on canvas, 25.5 x 39.38 cm, The Phillips Collection, Washington, DC. Wikimedia Commons. 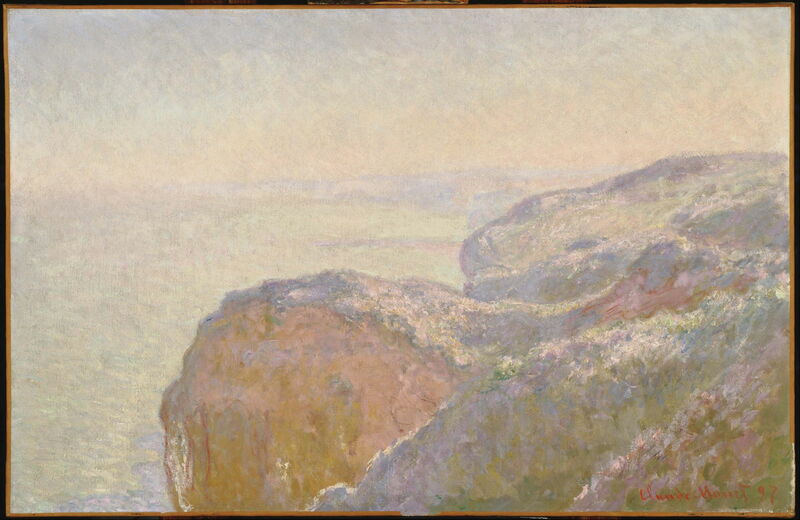 I am sure that Claude Monet had visited Dieppe on many occasions before, but his misty view along the coastal cliffs of Val-Saint-Nicolas, near Dieppe (Morning) (1897) is surely his most famous painting from here. Walter Sickert (1860-1942), View of the Hotel Royal (c 1899), further details not known. Image by Pascal Radigue, via Wikimedia Commons. 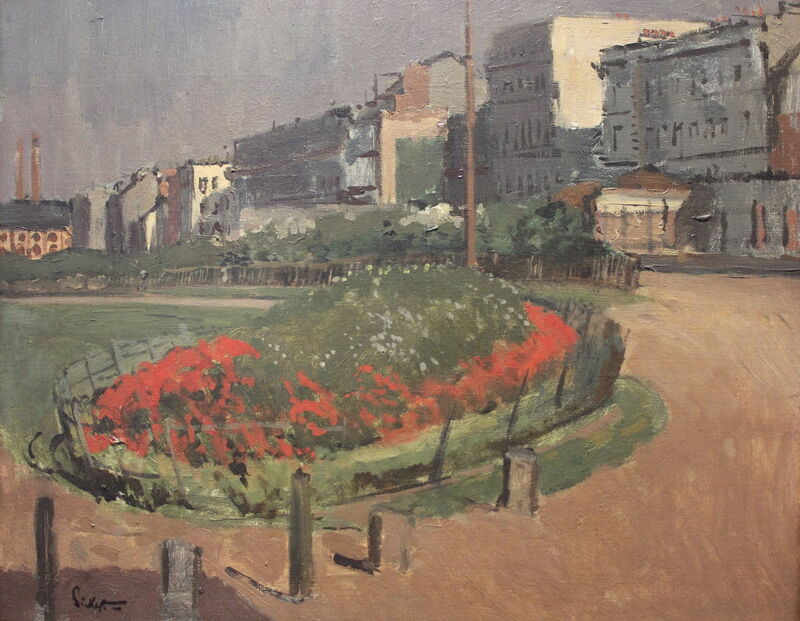 The British painter Walter Sickert spent a lot of time in Dieppe from 1885 onwards, as it was where his mistress and her son (believed to have been Sickert’s) lived. Among his paintings of the town is this View of the Hotel Royal from about 1899. 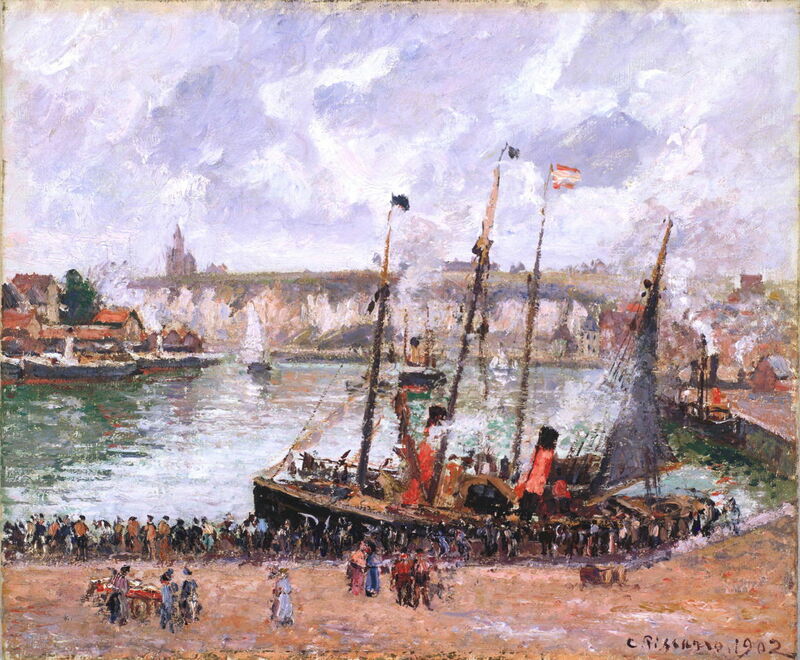 Dieppe was most significantly the location of some of Camille Pissarro’s last paintings, just a year before his death in 1903. Pissarro had suffered recurrent eye problems which prevented him from painting en plein air, so in his later years worked mainly from rooms in the upper floors of hotels. He visited Dieppe for this purpose in 1901 and 1902. Dieppe Harbour (1902) shows a small steam packet which is unlikely, even in summer, to have crossed the Channel, but may have taken tourists on day cruises along this stretch of coast. At various times, there were also ferry services from Dieppe to the Channel Isles, on the other side of the Cherbourg peninsula. Camille Pissarro (1830–1903), The Outer Harbour of Dieppe, Afternoon, Sun (1902), oil on canvas, 53.5 × 65 cm, Château-Musée de Dieppe, Dieppe, France. Wikimedia Commons. 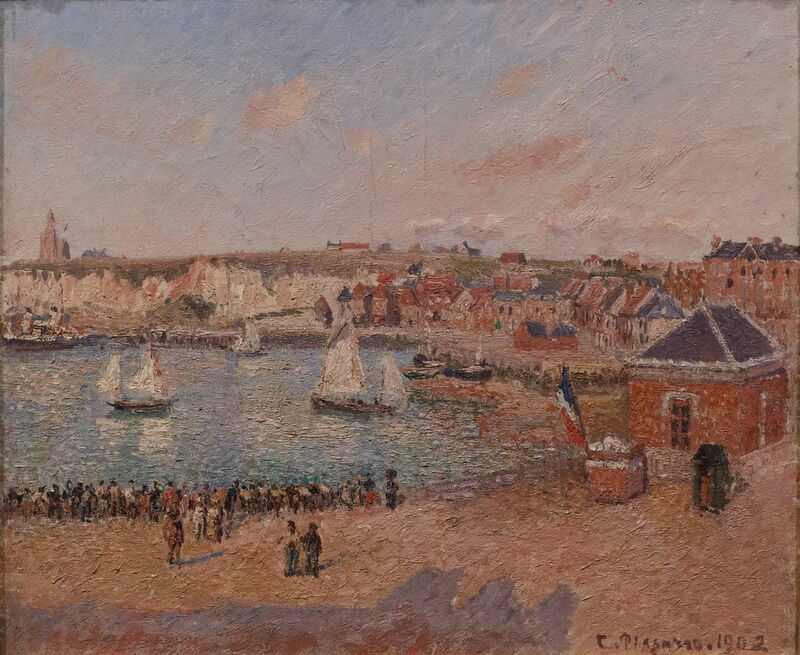 Pissarro’s quayside is still lined with people in this view of The Outer Harbour of Dieppe, Afternoon, Sun (1902). Camille Pissarro (1830–1903), The Town Fair by the Church of Saint-Jacques in Dieppe, Morning, Sunlight (1901), oil on canvas, 65.3 × 81.5 cm, Hermitage Museum Государственный Эрмитаж, Saint Petersburg, Russia. Wikimedia Commons. 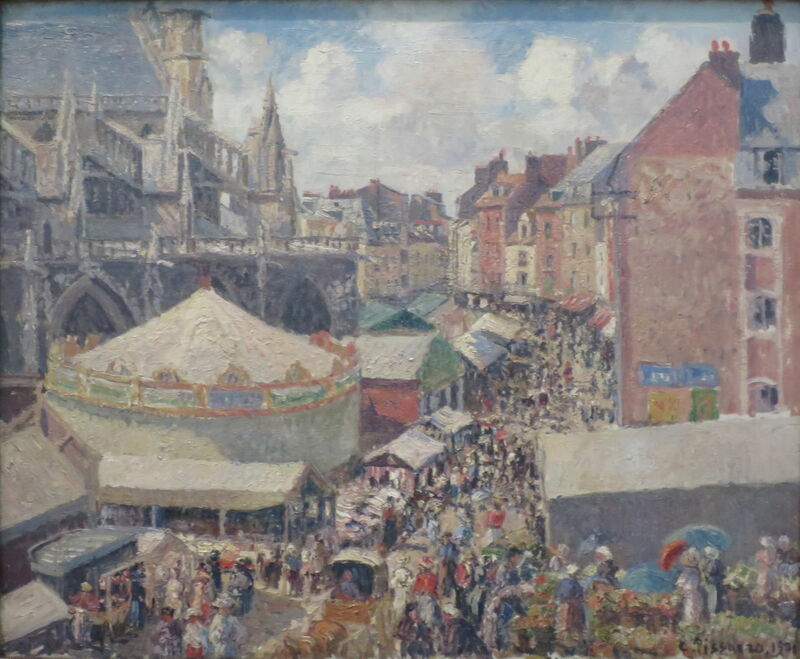 Earlier in his long career, Pissarro had been fascinated by fairs and markets. In The Town Fair by the Church of Saint-Jacques in Dieppe, Morning, Sunlight (1901) he revisited that theme, probably for the last time. Behind the large circular marquee is the town church, which he painted separately too. 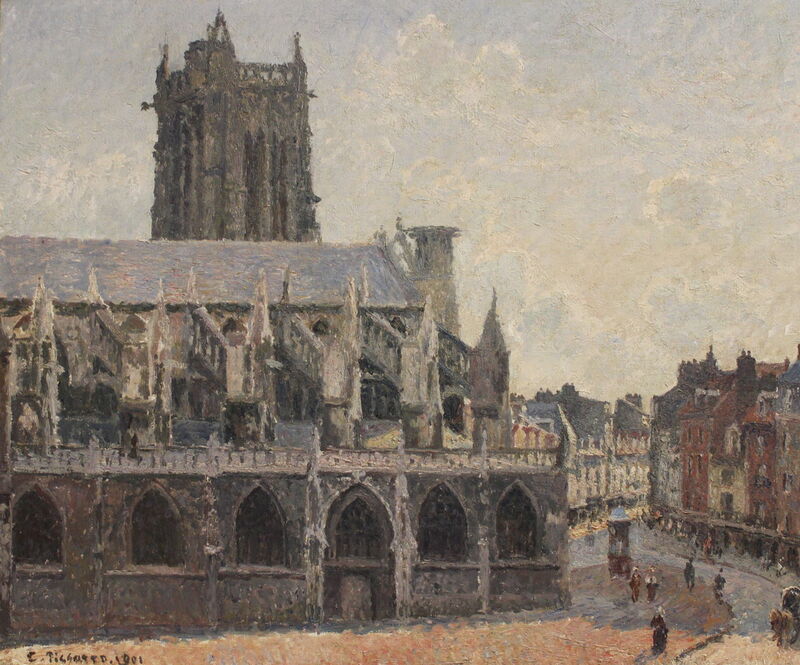 Camille Pissarro (1830–1903), The Church of Saint-Jacques in Dieppe (1901), further details not known. Image by Pascal Radigue, via Wikimedia Commons. In The Church of Saint-Jacques in Dieppe (1901), the streets beside the church are now almost deserted, and the fair gone. Gustave Loiseau (1865–1935), Dieppe Harbour (1926), oil on canvas, 61 × 73.7 cm, Private collection. Wikimedia Commons. Gustave Loiseau was a post-Impressionist painter of the next generation, mostly remembered now for his Parisian street scenes. 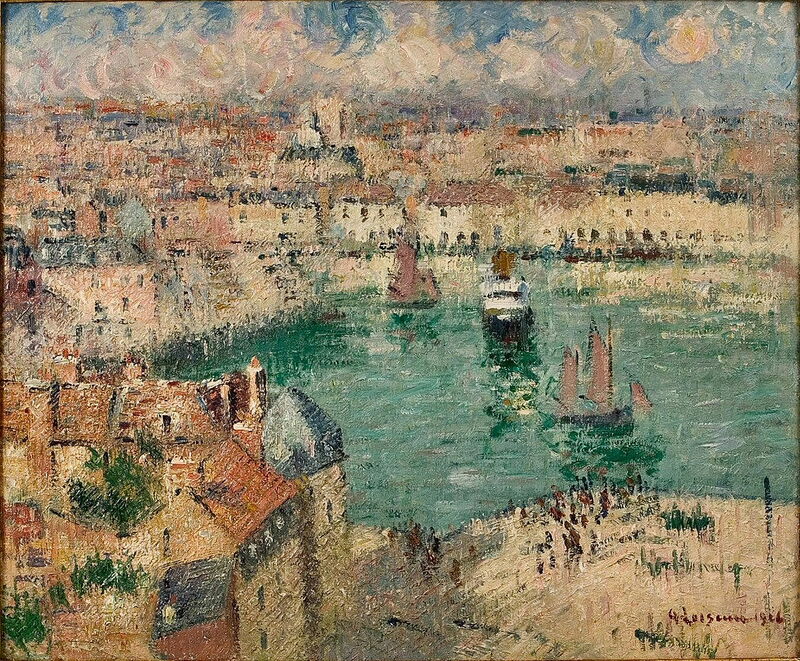 He visited Dieppe, and his 1926 painting of Dieppe Harbour stands as one of his finest landscapes in his characteristic en treillis (cross-hatched) style. Dieppe suffered, and saw suffering, during the Second World War. The invading Germans destroyed its casino, which had been painted by Blanche. Then on 19 August 1940, the Allies launched a disastrous raid, which attempted to occupy the town for a while to draw the Luftwaffe into battle. Over 1400 Allied troops were killed, nearly a thousand of them Canadian infantry. That raid achieved nothing of value. I’m told that Dieppe scallops are particularly good to eat. Posted in General, Life, Painting and tagged Blanche, Boudin, coast, Cotman, Gauguin, Helleu, Impressionism, Isabey, landscape, Loiseau, Monet, Noel, painting, Pissarro, Sickert, Turner, Vernet. Bookmark the permalink. Brilliant way to focus so much lovely art, much of it unknown to me, and so many diverse artists’ work! Thank you for creating this exciting post, full of great, well-organized information and enchanting art! 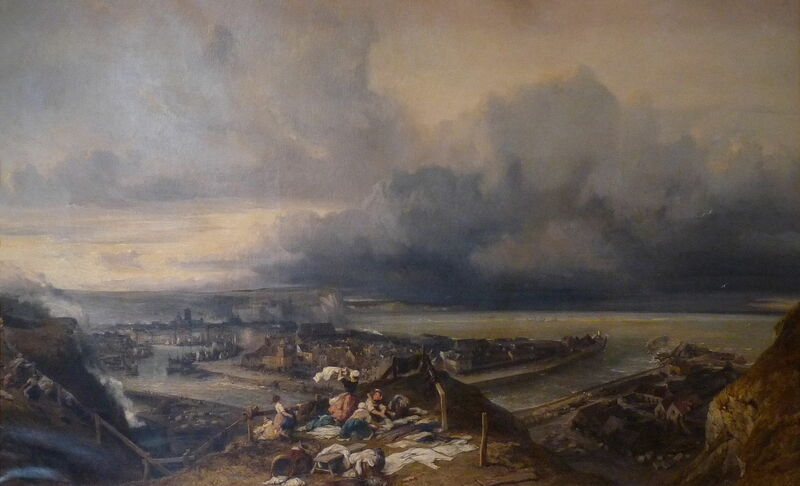 It was quite a revelation to research – I had no idea how many major artists had painted Dieppe.